Being woken out of a sound sleep by angry screaming is not my favorite way to be woken up. I much prefer my usual way of being woken up – a hug and a kiss. Then, Sweetheart hands me a cup of hot coffee. Sometime after going to bed Saturday night and well before Sunday’s sunrise, though, I was jarred awake by screams. It was a mild night. We’d left windows open, so I couldn’t localize the sound precisely, but I was hearing it from the south- and west-facing windows. I walked to the phone, listening to whether the screechers were moving in a particular direction. When I got through to Police Dispatch, I told them it was two, maybe three people. Then, I woke Sweetheart. I put on a sweatshirt and went downstairs. The dog was in the living room. I rolled my eyes – what was he thinking, walking out there by himself? – and held the door open for Tuki. Sweetheart was standing on the grassy median between the sidewalk and street in front of the house next door, watching two women and a man. They were standing in the street close to the sidewalk on the other side. The women were screaming at each other, the man chiming in less frequently. They stopped when they saw the dog. Tuki, standing at the point where she was when the combative lady threatened to tase her. She and the two other screamy people were standing in the street a bit behind the parked car opposite Tuki. One of the women was asking. “I got a taser,” she said. 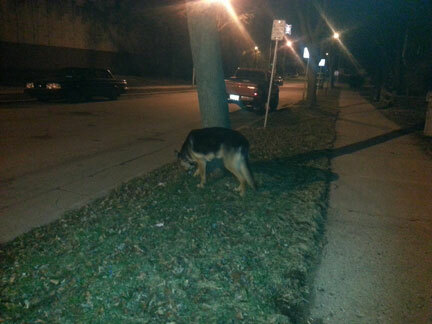 The dog, having just taken care of some dog business, was busy sniffing the ground. At 14 ½, with a bad back leg and an arthritic back, she’s not exactly a threat. But she still looks to someone who doesn’t know anything about dogs as if she could be. I was in the process of deciding exactly how to respond when the first squad came around the corner. The SUV stopped short of the trio standing in their way and an officer got out. “Is everything okay?” His voice was friendly, neutral. “Where did all this blood come from?” His tone was no longer neutral, and as he spoke, another SUV rolled up behind the first one. More officers got out. Another car came around the corner and stopped – I thought it might be an unmarked car. It was the paper carrier, who couldn’t get around the two squads. He’s not a fan of Tuki, who hadn’t noticed him placing the paper in front of the next-door house. So, before he got wise to her presence and she to his, I offered to deliver the rest of his papers. We walked back to his car together. The back was piled from the floor to nearly the top of the seats. “That is a $&#(load of papers!” I said. As he reached for the right ones – a Chicago Tribune, a New York Times and two Milwaukee Journal Sentinels – he told me it was because he was delivering an extra route. I walked down the street, putting the papers where they belonged. In the time that took, three more squads arrived in quick succession. Officers were talking with the combatants one at a time; the others were sitting on the curb. As I was laying the last paper in front of Linda’s, a beat-up 90’s junker came screaming around the corner, its driver flooring the gas as he pushed the engine to its limit. He was probably clocking 50 mph. His reaction to the phalanx of squads at the other end of the short block was to do immediately what the cops were yelling. The car screeched to a stop in front of Linda’s. I could see the driver through the open car window – an overweight man, Hispanic or African-American (the light wasn’t good enough to see more clearly). The police were yelling loudly enough that I could hear it from the porch. So I knew he could hear it from the car. “Why are you driving like an idiot?” one said. “Get out of the car!” said another. He did not get out. He sat there, with the engine running. The officers were not impressed. “GET. OUT. OF. THE. CAR!!!! That was when he started, very slowly, to back up, away from the other end of the street. Away from the squad cars. Away from the officers. Away from Sweetheart, still standing in front of the house next door with Tuki beside him, and away from the combatants on the curb. At the other end of the street, one officer yelled his plate number. Three officers began walking toward the car, guns drawn. The driver stopped and got out. I walked down to where Sweetheart and Tuki were still standing, watching the proceedings. We wondered aloud what kind of summer we’re in for if this was how the first warm night of the season was going, marveling at both the speed of the police response and our dumb luck at them being on-scene when the wannabe Demolition Derby driver shot around our corner. Two officers came over to talk to us before we went inside. One took down my information after asking whether I’d be willing to be the complainant for a disorderly conduct action involving the screamy trio. The other approached us shortly after. “I want to talk to the only sensible person on the street tonight,” he said. “And that would be the dog.” He knelt down in front of Tuki. She buried her face in his chest as he rubbed her head and skritched her ears. Good story though I’m not sure I’d be happy about the police drawing their guns because someone didn’t obey their command to stop. That’s no longer supposed to be legal. The reason for drawing a gun is supposed to be because they is a fear for their life or someone’s life I’d think. Though it might be argued that driving like an idiot could potentially be putting someone’s life in danger. Still how can you not like someone who loves dogs. This is no criticism of your writing or the story. It was crafted well and the story happened the way it happened. I didn’t write this part because I didn’t see it happen and because, frankly, I wanted to get this post up more than I wanted to work it to death, but while I was dealing with the paper carrier, a woman walked up to the officers and asked to file a complaint about the speeding car that had just nearly mowed her down. Then, when the car came around the corner, the woman identified it as the same one that had nearly hit her. I don’t know whether that makes what happened better or worse, but at the point the police were yelling at him, they had their own eyes plus a citizen complainant to back up any action they were taking.